The Chiefs were 1-5, and the Steelers were next, and hope was in short supply in Kansas City. That was October of last year. Andy Reid came into the team meeting room. The riot act stayed in his back pocket. Even more believable now. Reid’s Chiefs beat Pittsburgh 23-13 that Sunday, the tipping point for a 17-3 run that they’ll ride into Charlotte to face the suddenly spry Panthers this weekend. In this week’s Game Plan, we’ll sort through the Jets’ rubble, check on the Rams’ dormant quarterback, look at the Seahawks offense and the Chargers’ future, and get Mike McCarthy’s thoughts on Green Bay’s offensive issues. We start, though, with a team so bravely labeled by one AFC executive as the NFL’s most complete in last week’s Game Plan: “They’re well-coached, evenly balanced. They’re not great at anything but they’re good at a lot of things.” And that was before Kansas City beat Jacksonville with backup Nick Foles at the wheel Sunday. 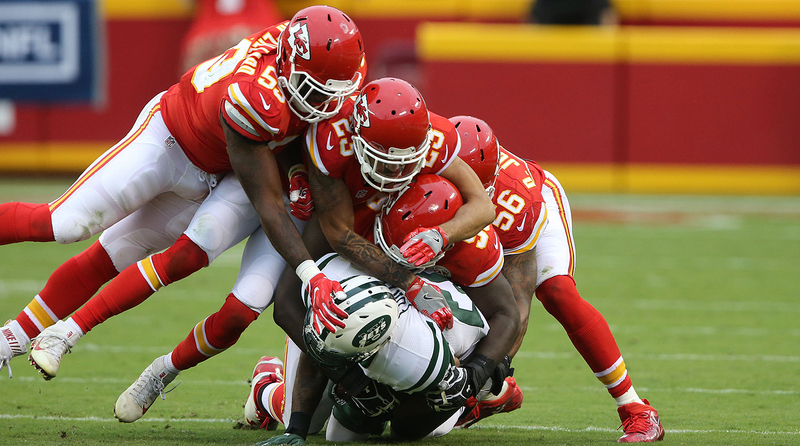 The Chiefs defense ranks eighth in points allowed per game (18.9) this season. How would I describe the Chiefs? They’re not the league’s best team right now, and maybe there are limitations, but they’re better than you think. That’s a result of what Reid knew when he talked to his team 20 games ago. The Chiefs were in the midst of pulling off what so many new GMs and coaches are trying to do in this time of raised expectations and job insecurity—the rebuild on the fly. Dave Gettleman turned the trick over his first three years in Carolina, and now it looks like Chiefs GM John Dorsey and Reid have done the same. With GMs guaranteed no more than two or three years (see: Phil Emery, John Idzik) and coaches sometimes out after a single season (Jim Tomsula, Rob Chudzinski), bottoming out isn’t an option everywhere anymore. So in some cases, the decision makers have to patch the ship and try to keep afloat while gradually gutting the operation. • THE MMQB PODCAST WITH PETER KING: This week’s guest: Ben Roethlisberger. Subscribe on iTunes. To that end, there are just eight players left from the pretty good team that Dorsey and Reid inherited in 2013. And just six of those guys (Johnson, Colquitt, Tamba Hali, Jamaal Charles, Eric Berry, Dontari Poe) are currently on the 53-man roster. Another, Justin Houston, is expected back this weekend. It’s something that, to a man, the players haven’t missed. The easiest way to see it is to examine what’s being demanded by Reid. The expectation is that they’re in the door by 7 a.m. and out no earlier than 5:40, with long, hard practices as part of the day. Even more so, if the team is built as envisioned, it’s that there’s no issue with upholding that standard. Not buying it? Maybe that’s understandable. Kansas City has won four straight, but two of those were one-possession games, only one of the wins came over a team with a winning record, and the run was preceded by a 29-point pasting at the hands of the Steelers. Plus, there’s a widespread assumption that having Smith taking the snaps limits them and there’s not really an overwhelming strength on the roster. But the team is ascending, behind players like Kelce and Peters and Eric Fisher and Dee Ford, and the last 20 games seem to bear that out. And all of those guys also understand that they’re being overlooked, which probably doesn’t hurt. To gauge how realistic that is, and with both Colquitt and Johnson having lived through 12 years, five head coaches and three GMs in Kansas City, I asked both whether or not this is the best team they’d played on. And that goes a long way in explaining how Reid, 20 games ago, had a pretty good idea of what he had before him, no matter what the record was. Through five games, Joey Bosa already looks the part of the versatile impact rusher the Chargers drafted him to be. 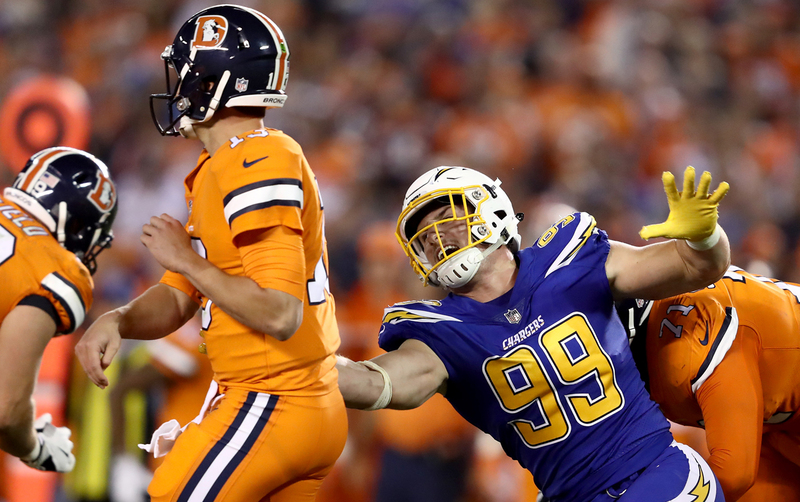 • During our podcast awards spectacular, Emily Kaplan and I handed defensive rookie of the year to Joey Bosa, despite the fact that he missed the season’s first four games. Good chance to see how right we were this week, with the Chargers defensive end facing Miami’s starry line. • The Jets put stock in left tackle Ryan Clady’s ability to stay healthy when they traded for the ex-Bronco following D’Brickashaw Ferguson’s retirement. Clady’s stock has crashed, so the spotlight shifts now to Ben Ijalana with an aggressive Rams front in town. • Saints quarterback Drew Brees, at 37, has been fantastic thus far, with 2,689 yards, 21 touchdowns and just five picks after eight games. And now he gets the vaunted Denver defense, licking its wounds after last week’s loss in Oakland. • Barring something crazy, Tony Romo won’t play Sunday. Whether he dresses will be interesting. If he has three good days at practice, he’ll be cleared, but the plan is to only give him scout-team reps this week. Which is … different from last year. • I’m fascinated to see if the Jamie Collins trade makes for a change in the deployment of Patriots linebacker Dont’a Hightower. There’s cash on the line for the 26-year-old over the next eight games, and New England effectively chose Hightower over his departed buddy. Sheldon Richardson and Mo Wilkerson are talented enough for the Jets to build around, but missteps by the players might have leadership thinking otherwise. 1. Chaos returns to Florham Park. The Jets were never as close to the mountaintop as it might have seemed last year, when Mike Maccagnan and Todd Bowles won 10 games in their first season together. It’s why until the end there was hesitation to bring back a win-now piece like Ryan Fitzpatrick. Based on what they inherited, and what they have now, the Jets still see themselves as two drafts away from realizing the vision the GM and coach have for the team. Now that the breaks aren’t going their way like they did in 2015, the warts that are part of the “competitive rebuild” (their term) are on display for everyone to see. And that brings us to Mo Wilkerson and Sheldon Richardson. When the current regime arrived, those two were really the only players that were both good and young enough to remain cornerstones when the team would be ready to win big. 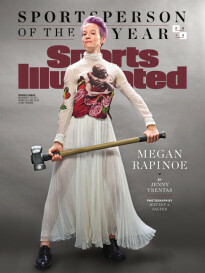 The problem was the cultural fit, and that kind of problem surfaces when a team loses. Now, tardiness isn’t exactly uncommon among NFL players. With Richardson and Wilkerson, it became more about the attitude accompanying the missteps. Wilkerson was told on the Monday before the Oct. 23 game against Baltimore that he wouldn’t play (he had an ankle injury), then missed the team’s Saturday walkthrough five days later, which was met with more of an eye-roll than shock inside the building. And when both Wilkerson and Richardson were late last week, no one was remotely surprised, which is a big part of why repercussions became necessary. The immature Richardson had been the subject of trade talks in the days before. The mercurial Wilkerson’s lingering problems weren’t going away. Bowles had to do something, and now the question really does become whether they fit long-term into what the current regime is trying to build, which is grounded in looking for the kinds of players that the Seahawks and Patriots and Broncos seek—guys with both football character and the head to play in a big market. Richardson has the former, but not the latter, at least for now. 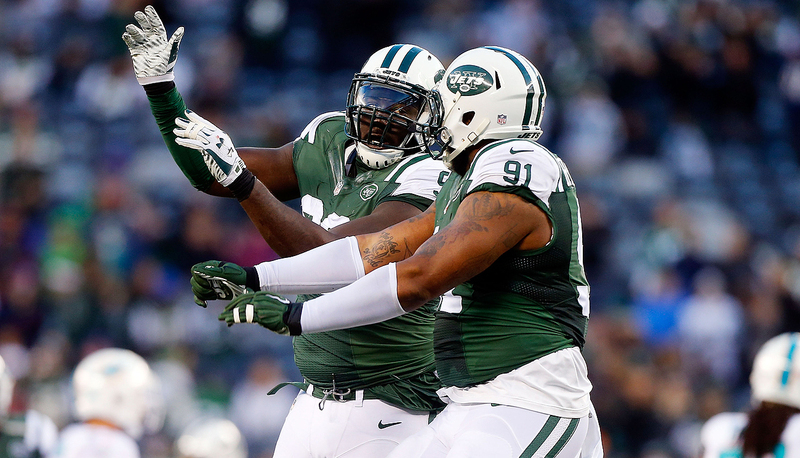 Whether Wilkerson will change his ways on both counts is anyone’s guess. What we do know is both have been put on notice by the head coach. 2. Rams waiting on more than Goff. We can get this piece of business out of the way first—the Rams knew what they were getting themselves into when they bought big on Jared Goff in April. At Cal, Goff ran an offense heavy on one-word calls and tempo, and light on ever making the quarterback go past his second read—if you see this, go here; if you see that, go there—or figuring what the defense was throwing at him. The learning curve was going to be steep regardless. But the Rams figured they’d at least have Todd Gurley rolling to help whoever was under center. That, as it turns out, was a bad assumption. And it’s what could keep the No. 1 overall pick off the field. Last week, the Panthers played their safeties within 10 yards of the line of scrimmage at points, basically daring the Rams to put the game on Case Keenum’s shoulders. And the Rams, to some degree, have invited all that with heavy sets, tight line splits and a fairly basic run scheme (leading to some internal questions about the readiness of coordinator Rob Boras for the job, and the future of line coach Paul Boudreau). Add it up, and your explanation is right there. Goff might be able to help the 2016 Rams. But when he was drafted, that had to be viewed as a 15-year decision. So on this one, at least, giving the individual player the best chance possible at long-term success takes priority. 3. New-look Seahawks. It’s been fewer than two years since Super Bowl 49, and just four of the 11 Seahawks who started on offense that afternoon will be in such roles Sunday night in Foxboro—Russell Wilson, Doug Baldwin, Jermaine Kearse and Justin Britt (then a right tackle, now the center). Six of the 11 are gone all together, and that’s big turnover in a short span for a top-shelf contender. But on Monday night we got a glimpse of the big-picture vision of John Schneider, Pete Carroll and offensive coordinator Darrell Bevell in how it was pieced together. Start with tight end Jimmy Graham. Last year it felt like he was being forced into the offense the way Percy Harvin was in 2014; the Seahawks lost their way early that season and wound up trading Harvin to amend that. This year you’re seeing the importance of time in incorporating a unique weapon like Graham. Seattle doesn’t throw the ball as much as New Orleans, nor does Bevell move Graham around like Sean Payton did, but Graham bought in like Harvin wouldn’t and the Seahawks were patient, and the eight-catch, 103-yard, two-touchdown breakout against Buffalo is proof it’s working. Then there’s the offensive line. Yes, there’s been attrition, but letting go Russell Okung and J.R. Sweezy was an acknowledgement that some rebuilding was needed. The lack of an overreach to acquire veteran replacements was Seahawks’ way of telling you they know line play is down across the league, and they feel the most efficient way to fix it was to develop their own (there are four rookie linemen on the 53-man roster) behind line coach Tom Cable. Will it work? It’s too early to tell, but as was the case with Graham, they knew there’d be bumps. Of course, it’d help to have a fully healthy Russell Wilson, and better health in a backfield that’s still searching for the right mix in replacing Marshawn Lynch’s production. But after the win against Buffalo, it’s getting a little easier to see where all of this is going ahead of Sunday’s showdown in New England. 4. Charging forward. With San Diego’s voters resoundingly shooting down a ballot measure Tuesday to fund a new downtown football stadium, it’s back to the drawing board for the Chargers’ brass. And as some in the league see it, it’s now time for the Spanos family to generate options for themselves, the way Mark Davis has for the Raiders in Las Vegas, with nothing doing in Oakland. So where could they go? After talking to a couple people in-the-know, there are a number of levers the Chargers could pull, if they’re more willing to open things up than they have been in the past. The three most obvious ones are right there in Southern California. 1) The team could try to reprise the Mission Valley concept that Mayor Kevin Faulconer preferred from the start: a new venue to be built adjacent to the current Qualcomm Stadium. The Chargers own the land, it’s already zoned for a stadium, and it’d be much cheaper than the downtown proposal was going to be. 2) The team could just accept the deal on the table to join Stan Kroenke and the Rams in Los Angeles—the Chargers have an option to do so that expires Jan. 15—that would require no cash upfront or debt incurred and would likely juice the franchise’s value (defraying the $650 million relocation fee and then some). Or the team could try to negotiate a different deal with Kroenke. If the Chargers want more time, with the Raiders focused on Vegas, the team could apply for an extension on its option to go to L.A. 3) Outside of Southern California? If the Raiders go to L.A., then the Chargers could replace them by moving to the North Bay or try to get the Vegas deal. (The Spanos family has roots and business interests in both of those areas.) The other option would be to look at the San Antonio/Austin market, which put a strong deal in front of the Raiders before the Vegas option came about. The likeliest outcome? At this point, both the Chargers and the NFL have shown how badly they want to stay in San Diego, so it might be finding a way to stall the option in going to L.A. The risk is that if a deal’s not done, Kroenke’s efforts to sell naming rights and PSLs might be complete. But if Tuesday’s vote highlighted anything, it’s that there really isn’t any perfect plan out there for the Chargers. Derek Carr and the Raiders would have a first-round bye if the playoffs began today. 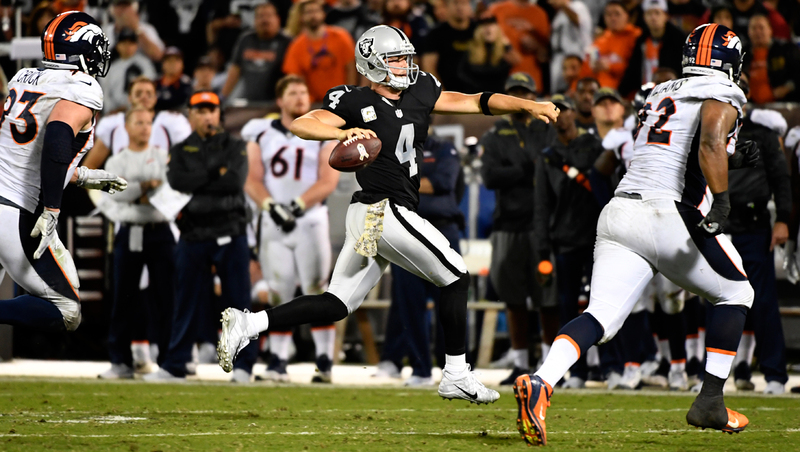 • How did MVP candidate Derek Carr fall to the top of the 2014 draft‘s second round, and into the waiting arms of Oakland at No. 36? Some deny it, but I gotta believe at least part of it was his last name, and I have an anecdote that I think backs that up. At least a couple teams had “soft” as a knock on Carr coming out, which would cover an evaluator if Carr got beat up and went punch-drunk like his brother, David (2002’s first overall pick), did in Houston a decade ago. An evaluator from one of those teams told me, after looking at Derek Carr’s Fresno State tape, he was befuddled how the conclusion could be made that the younger brother couldn’t take hits. The Raiders, you might guess, aren’t mad that these teams came to these conclusions. • Why might the Panthers’ two-game rebound be the precursor for something bigger? For one, they’ve done it before, having bounced back from a 1-8-1 start two years ago to make the playoffs, win a game when they got there and set the stage for last year’s Super Bowl run. For another, they’re finally doing the things that got them to Santa Clara last February. For all the noise about Josh Norman’s departure and the secondary’s problems, the 2015 Panthers’ foundation was in the run game on offense and the front seven on defense, and the production in those areas seems to finally be on the upswing. K.D. 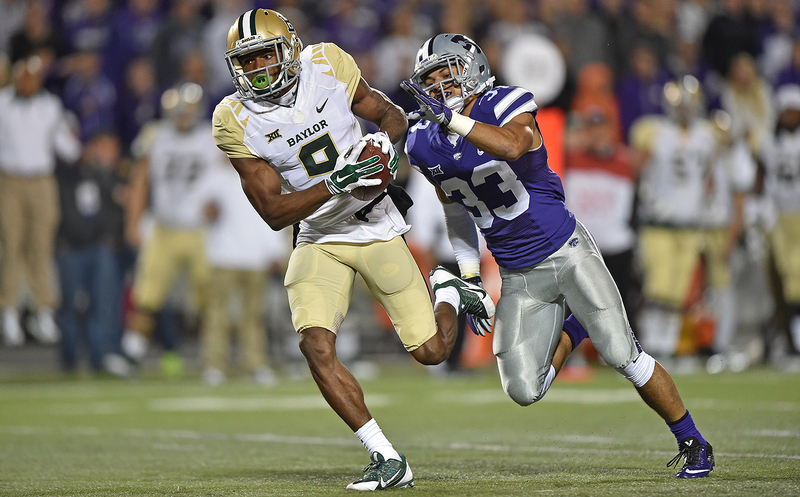 Cannon is the latest in a string of talented wide receivers at Baylor. 1) Baylor WR K.D. Cannon (at Oklahoma, ABC, noon): For as much crap as the Baylor offense gets for quarterback development, it’s hard not to notice the job the Bears have done bringing receivers through the program and into the NFL. From Josh Gordon and Kendall Wright to Terrance Williams and Corey Coleman, it’s clear that a lot of their guys can play. And that brings us to Cannon, who arrived in Waco more highly regarded than any of them and almost immediately delivered on his potential, posting a 1,000-yard season as a true freshman. Two years later, amid a tumultuous time for the program, Cannon has 560 yards and six scores on 40 catches through eight games as a junior and figures to throw his hat into the draft ring after the season. The question is where his ceiling is, relative to other pass-catchers who’ve come through the program. The truth is, and this may be a result of playing in that offense, he’s still seen as raw. “Fast vertical threat with big-play ability,” said one area scout who covers Waco. “He’s not as elusive as Coleman, but he’s probably a better [version of] Williams. 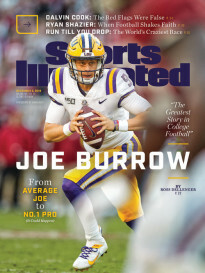 His hands and routes need to improve.” Another area scout said, “I don’t think he’s a top prospect, just a speed guy who makes big plays in their bull---- offense. … He doesn’t run routes, he either runs half-speed off the line of scrimmage or he runs very fast in a straight line. Doesn’t do anything else.” Playing Oklahoma will at least give Cannon a stage to disprove some of that, and since he figures to be a combine star, my guess is Cannon’s high-end potential will elicit some healthy debate in the draft run-up. 2) Florida CB Teez Tabor (vs. South Carolina, CBS, noon): Gamecocks coach Will Muschamp returns to Gainesville and will find his own creation—a nasty defense that has a handful of players that have potential to start in the NFL as soon as next year. And Tabor, a scrappy 6-foot, 191-pound All-Conference corner, is at the top of that list—and may be every bit as good as Vernon Hargreaves was last year coming out. Hargreaves, of course, went ninth overall. “He’s a better athlete than Hargreaves,” said one AFC personnel exec. “More competitive too.” An AFC college scouting director described Tabor like this: “Great size, great athletic ability and he plays with great confidence, but a number of people think [fellow Gator CB Quincy] Wilson is the better one.” That’s probably as indicative as anything of how loaded Florida is with prospects on defense. Tabor had four picks (he has nine for his career) in a five-game stretch earlier this year, and now he and the rest of the Florida defense get the challenge to go head-to-head with a coach who knows them all as well as anyone. 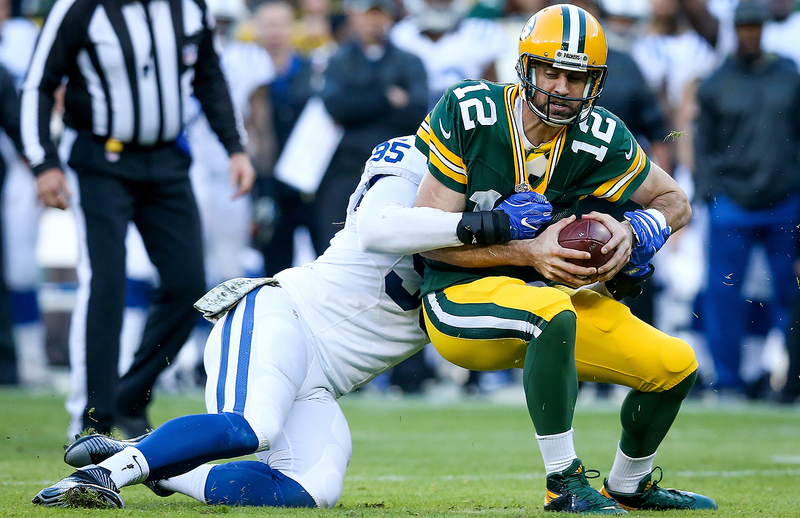 Packers QB Aaron Rodgers has been sacked 17 times in eight games this season. When you have Aaron Rodgers at quarterback, the bar is—and should be—a little higher, which is why Green Bay’s ranking of 16th in total offense has been the subject of concern halfway through a season that finds the Packers at .500. Mike McCarthy isn’t here to tell you to stop worrying. (We’ll get to that.) But as he sees it, the idea that Rodgers has slipped just isn’t quite right. And this is where he’ll take it on himself—part of the statistical drop can be attributed to a change instituted in the offseason, when McCarthy took play-calling back on a full-time basis after ceding it for 2014 and half of 2015. “Do I think that’s accurate [that Rodgers has slipped]? No,” McCarthy told me, around lunch Wednesday. “He’s playing in a different offense this year. Yes, we have the same terminology, most of the scheme is the same. But we changed who calls it, there’s an adjustment in structure, how it’s called, and he was operating with two play-callers last year, and now it’s back to me and how I called it prior. The change in structure back to having the head coach calling plays was never about being impressive in September, because there’s no question the Packers were that in 2015. It was about ascending again as an offense. And that’s where McCarthy understands where some have fretted over Green Bay not operating offensively at the level they’d become accustomed to. But he also sees plenty of promise that they’ll get there soon. From the head man’s perspective, the Packers had two things to clean up over the past few weeks. The first was their turnover problem, which, for the most part, they have accomplished. After committing nine turnovers in their first five games, the Packers have coughed it up just twice in their past three contests. The second issue—getting more big-play production—is a bit more complex, but there are obvious examples of small details missed leading to larger opportunities blown. In the Indianapolis game, one was a dropped ball by Jeff Janis. Another was rookie Don Jackson’s alignment being too deep on what was blocked up to be a big-gainer on the ground. The upshot is, as the game wore on, things did start to come together—Green Bay ran up 155 of its 405 yards in the last 10 minutes of the loss to the Colts. The Packers, even at 4-4, are just a game out of first in the NFC North. The flip side is that the new/old play-caller knows the rest of the season will wait for nothing, so the idea is for all this change to pay off soon. “Does everyone have a book on me as a play-caller? Hell, they better keep a book on me, that’s the job,” McCarthy said. “But the two things you have to recognize, yes, they have a book, but I got a book on them and I got a book on myself. We’re doing some things different, absolutely, for a number of reasons, including our self-scouting. We understand our tendencies better, can fit it to the players. And figuring it out has certainly been a process the past few years in Green Bay. What’s for sure? Rodgers is still a huge part of whatever the solution is.